Dax Rigby has been sent to Arcadia to report on the war between two native species: the Flyers and the Hoppers. 900 light-years away from Earth, which is embroiled in World War III, Rigby finds himself the target of assassination attempts, the recipient of strange behaviour of obviously sick, human inhabitants of the outpost and, eventually, hes even accused of being an enemy spy. Amidst all the intrigue, the reporter discovers a terrifying secret which promises the destruction of the Arcadians, their human survivors and millions of people on Earth. Can he get this information out before his hidden opponents permanently silence him? Dax Rigby, War Correspondent began comfortably, like I was putting on a favourite sweater. Once again (Ive read other works by Rosenman), I was reminded of science fiction in its early days, specifically the works of Robert A. Heinlein. However, as the author ratcheted up the action and the conflict, Rosenman came into his own. The book offered a look at and commentary on individual behaviour in war. It was also a fine tale about alien contact and mankinds interactions and effects on the species. Want to experience what science fiction used to be and why it is sorely missed? 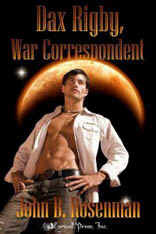 Read Dax Rigby, War Correspondent. For more reviews or to buy Dax Rigby from Amazon.com, click here.